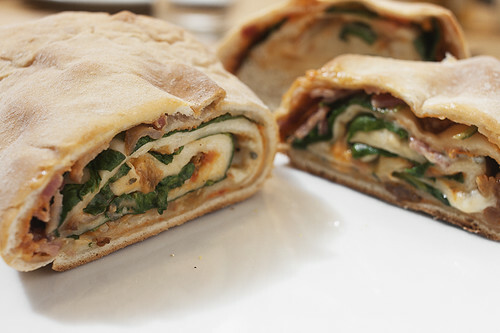 stromboli with hickory smoked bacon, baby spinach, gorgonzola cheese and golden raisins, originally uploaded by aarn! +6th September, 2011+. whipped together a few cloves of crushed olive oil poached garlic, some garlic oil, a little bit of tomato sauce, and an egg (since this stromboli does not have a gooey binder cheese, like mozzarella, the egg was added to hold things together and absorb extra moisture during cooking). rolled out some plain pizza dough into a large rectangular sheet (about ¼-in thick), then brushed the garlic-tomato-egg mixture over the entire surface. covered the dough with pre-cooked bacon (had been baked and then chilled), crumbled gorgonzola cheese, golden raisins, baby spinach and salt and pepper. rolled up from one side and tucked the dough from the ends underneath, to seal everything in. covered a pizza peel with cornmeal and transferred the rolled dough to it. slid the dough onto a 400-degree baking stone in the oven until brown on top, then let rest for about 8 minutes and then sliced and served.